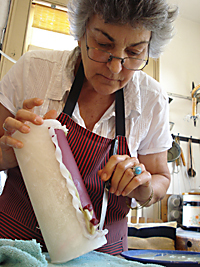 For more than 30 years candle artisan Susan Bradley has been making candles and sculpting in wax. From San Francisco to St. Augustine, Florida, her craftsmanship has developed style and beauty. In a shop from the 1700’s in the historic section of St. Augustine, Southern Lights has made and sold candles for over 35 years. All of our candles are made on premises. Working with soy, beeswax, bayberry, and paraffin, we find the best wax blends for each application. With over 50 fragrances from essential oils, we have many choices and will gladly custom pour and scent candles to your specifications. From our retail store, we expanded to this website where we are one of the largest suppliers of real Bayberry candles online. It is our pleasure to keep the age-old tradition of burning Colonial Bayberry candles alive and well to help ensure health and prosperity to all who burn them. Contact us with your comments, questions, or special requires for your next occasion. Please email using our contact form here – your inquiry will be given prompt and courteous attention! We will be happy to contact you to discuss your needs. We welcome dealer inquiries regarding corporate and wholesale opportunities. Please note that our minimum wholesale order is $150.